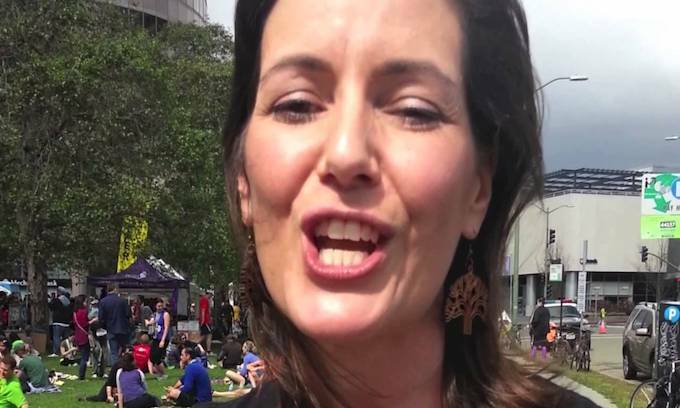 Libby Schaaf, mayor of Oakland, CA. may she be the first to be assaulted by these illegals. i am sure oakland is so very proud of this idiot. A conservative is a liberal who’s been mugged. ONLY if when we bus them there, WE ENSURE THEY STAY there..
Democrat ploy to increase their voting base…. She is baiting Trump and may have been delegated to say that. Its a strategy to avoid what they fear the most. Which is.. The containment of illegal voters to only certain parts of the country. The Dems do want her city overrun, so they can media blitz the onslaught with all sorts of distortions and lies while concentrated to only one small city. And then claim, that it would be what would happen in all the sanctuary cities if allowed to continue! Its a baiting ploy used as a means to keep it from ever happening in other sanctuary cities where things would be spread thinner than this one small area. THEN i say LET THEM CRY.. And laugh our butts off at them, when they do! meant to reply to genemz. Trump was not baiting. He was threatening. Now, they must try to control the damage of their own stupid lying. That is why if she can bait Trump to start first with her relatively small city? And, the fake media blows it up in a distorted way showing how horrible it would be with all these illegals coming to the other sanctuary cities? If only her city first? All the other sanctuary cities could cite Oakland’s fiasco as to why Trump should not force them to take all the illegals! But? If Trump simply distributes the illegals and disperses them to all the sanctuary cities at the same time? They will have to eat crow as Trump flashes all their pro-illegal immigration clap trap that are on record. Its needs to be done all at once to all the sanctuary cities. Simultaneously busing to all those cities at once. The brainless mayor of oakland asked for it. Trump should give it to her. Flood oakland with these illegal invaders, and see how long she remains mayor. Thing is bait. EVEN if we bused them there, there is ABSOLUTELY no way we can keep them there.. I am not sure that Trump is bluffing. Just to make sure, he should start sending ALL of the illegals there. I bet they would be tired of it in about a week. They’d be tired of it in an hour… they just wouldn’t admit it for about a week. I haven’t been in Oakland for almost 40 years. It wasn’t particularly a “garden spot” then (late 70’s) and I don’t expect the Mayors plans are a panacea of improvements. Welcome to California! I feel very strongly both ways about shipping them to California. They are fighting to keep the citizenship question off the next census, and the sole reason for doing that is to steal Congressional seats (and EC votes) from smaller states. But, some of the smaller states also have “sanctuary cities”, so let’s stuff those cities to the rafters with every illegal ALIEN we can. Force them to confront the mistake they are making, and maybe force them to reconsider being “sanctuaries”. BUT, let’s pick out all of the MS-13 members we can identify, and deliver them to Oakland, San Francisco, and Los Angeles. Send a few busloads to Seattle, and balance that out with some to Chicago and Baltimore. That is a great idea! I say, the more in places like Seattle and San Fransicko, the better! I say there should be only 1 way to handle SCUM like MS-13.. A public guillotining, then spike their heads along our border wall! Nope. Never seen GoT. Hell, i am not really caring to bother seeing it either.. Though for an alternate method of eradicating MS-13.. IF star gate was real, Send them all to the Pegasus galaxy, directly to a planet we KNOW the Wraith are on!!! Here they come, all 100,000 of them. Farm them out to your constituents. Some illegals could get jobs cleaning up all the human feces on the sidewalks in San Francisco. What, and deprive the San Francisco municipal employees, with full union benefits and guaranteed jobs of their share of the unionized City pie? Mayor Libby Schaff… the name itself says volumes. What a clueless, pompous, arrogant American hating, Constitutional despising socialist. She’s drunk on false power with the conception that there is an endless supply of public money. I’m afraid the only way to deal with someone like that is to keep giving them more and more rope until they hang themselves. This might work out Libbey has told the President that she will take all the can send. Since she is agreeing to take them than in Oakland , Alameda County and State of California are now responsible to feed clothe ,provide, housing can’t use cages Mayor. Also schooling,medical and all the other freebies she likes. Wonder how the citizens that just had a couple hundred million cut causing lose of education programs ,employees and now the mayor agrees to take in lots more jobless poor people. I wonder how all the homeless that seem to be everywhere in Oakland will feel about having to lose help and funding. Wonder how the working Hispanics will feel and react to their wages going down as thousands more try to enter the job market. Wonder how high the rents will go as more people vei for housing. Most I wonder how the hard working Black population will accept more freeloaders . Oakland has many problems to solve and bringing in thousands more people into Oakland will just create a disaster. Since Libbey wanted the illegals and said she would take as many as she could get, the federal government will no longer be responsible for them, and if they try to leave, commit crimes or run affoul of law she will be making Oakland responsible for it. It would be interesting to poll say 10000 people living out there, after say 1 week, then again 1 month later.. The immigrants will “escape” from Oakland and scatter like roaches in a bright light … all over the nation! That’s a possibility that can’t be ignored. Which is why i say, IF AND ONLY if it could be done.. Put a cranial bomb in their head TIED to repeater stations IN that city. If they ever leave it, the bomb goes off..
She probably has a big wall around her house, let them all camp in her yard and use her facilities She can have free big Macs for them also. let them crap in her yard. Stop talking and start doing ! Stop threatening and start acting ! He said he’d build a wall… then BUILD IT. He said he’d dump the garbage in Sanctuary Cities… then DO IT ! Sorry folks but I’m tiring of talk and threats, I want action. The election is only two years away. Me too.. I am sick to death of hearing politician after politician promising X, but never delivering… RESULTS to me matter, not whether someone ‘tried but failed/was held up by the courts etc’..
To Everyone saying go ahead and bus them to sanctuary cities, I’m sorry but the Democrats would find a way to use them for votes. The BEST thing we can do is DEPORT their sorry ***** right back where they came from. Once they crossed the border ILLEGALLY they became Criminals. No further change for Asylum, no chance for Citizenship, No chance for Amnesty. Send MS13 to her district. Let’s see if she likes it.